The Performance Coaches gave back $423.54 to the market today, bringing their balance to the closest its been to the Trailing Max Drawdown. That stands at $48,997 - just 305.77 away from today's closing balance. Here's how they plan to get back towards the positive. Stop re-entering positions right after being stopped out. The Coaches have succumb to the mental mistake of re-entering positions right after they were stopped out. It happened today in their Crude Oil ($CLF8) short, where they got stopped out at $56.10 and then re-entered the position, only to get stopped out at $56.25. The Coaches say it all the time - but the stop should be placed where it proves the trade invalid. If that were true, they wouldn't need to re-enter because it means that Crude would be going higher. Define the day - whether it will be a range or trending day - ahead of time. Sometimes you don't know whether prices are going to range or trend. Other times - like when there's low volume in a holiday week - you can use your best judgment that it's not going to be a trending day, even if prices break below prior support, as they started to do today. On low-interest days, the prevailing trend will win out. The Coaches shorted the Emini S&P 500 at what seemed like a good price. It was well above the overnight lows after the price started to rally from being down sharply. However, the trend is higher. And in the absence of any strong selling pressure, it's clear that prices will drift higher. Taking these lessons to heart, the Coaches will try to recover from their Trailing Max Drawdown. 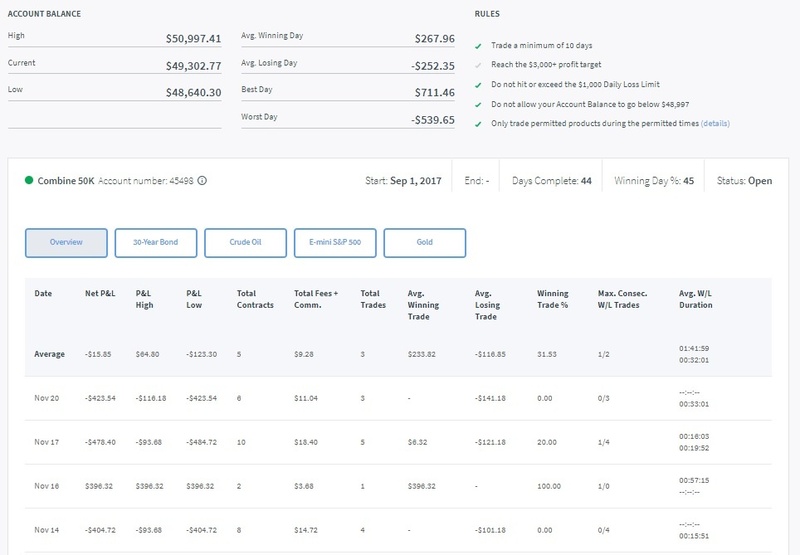 Given the rules of the Trading Combine®, they actually have two more losing days ahead of them so long as they don't lose more than $305 on the next trading day. Given that, their backs may be against the wall, but don't count them out yet. Performance Coaches took another loss today in #CoachesCombine. Went short $CL_F at $56.10, stopped at $56.25. Total performance for the day, including fees and commissions: -$423.54. Balance is $49,302.77. For more, check out their Trading Combine dashboard below.